Cavity? 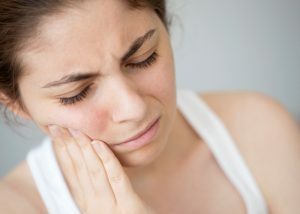 Costa Mesa Dentist Answers - How do I know if I have a cavity? How will you know if you have a cavity? Just because you aren’t experiencing any pain doesn’t mean everything is fine and dandy. You could have active decay that is in the early stages and may be able to be reversed with professional dental care. Tooth decay exhibits a variety of symptoms depending on the severity of your tooth decay. What to do if you have a cavity? A quick exam at our Costa Mesa dental office will let you know the best course of treatment for your particular situation. The recommendation could be as simple as a “watch” with recommendations for home care to fluoride treatment. If the decay is more pervasive or you are experiencing any of the symptoms above, Dr. Jeremy Jorgenson may recommend treatment for the cavity. Treatment options could include a composite (tooth-colored) filling for moderate decay. 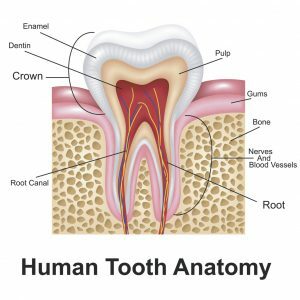 If the decay is covering many surfaces of the tooth or has affected deeper layers of the tooth a dental crown may be recommended. In more severe situations, the decay can reach the pulp which houses the nerves and blood vessels of the tooth. Once decay has gotten this far a root canal and dental crown would likely be the recommended treatment. If decay has completely destroyed the tooth or if the infection is too pervasive the tooth may not be savable and might have to be extracted. How to prevent a cavity? You can help prevent the damaging effects of plaque and tartar at home by brushing twice a day with a soft bristled toothbrush, using a toothpaste with fluoride, and flossing at least once a day. Additional preventative measures include eating a well-balanced diet, rinsing after meals if you can’t brush, and asking your dentist about fluoride treatment. Most importantly, seeing your dentist at regularly prescribed visits can determine if the above measures are effective for you. Obviously, the best time to catch a cavity would be in the early stages, when there are few, if any, symptoms (trust us on this one). That’s why the American Dental Association (ADA) and dental professionals stress the importance of maintaining regular visits to your dentist. Although we are always here when you need us, we don’t want to get into the habit of only seeing you when you are in pain! At each visit to our office, we will continue to evaluate whether we need to see you every 3, 4 or 6 months in order to ensure you are maintaining good oral hygiene. You can always schedule an appointment by calling/texting us at (714) 424-9099, by email at info@mycostamesadentist.com, or by clicking “Book An Appointment“. Think you need a dental crown? Get 50% off an all ceramic crown upgrade until November 30, 2018!